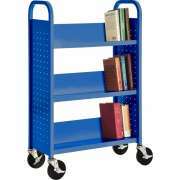 Stack, store and transport literature in one of our sturdy book carts. 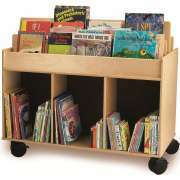 Librarians and teachers are sure to appreciate our selection of library carts, which make it easy to move books around. What is the easiest way to move books? This great library furniture enables all of the information you need to be easily rolled into place. 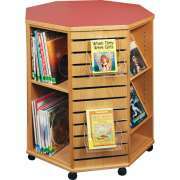 Our selection of book displays includes many different shapes and sizes. If you prefer a more open arrangement, we also have book trucks. 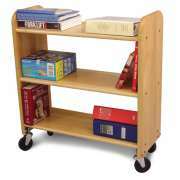 Our book carts are designed to facilitate easy organization and efficient transport. 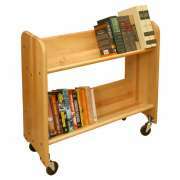 What kind of book cart is best for a library? If you just need an easy place for people to drop off books, a book truck is the way to go. This wooden cart is available in a choice of finishes. It can be coordinated with your circulation desk for use in conjunction with a book return, or utilized as a stand-alone piece for reshelving books. 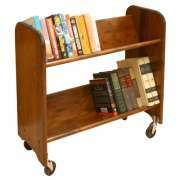 A wooden book cart has a natural appeal that can be coordinated with other library furniture such as study tables and bookcases. Catskill Craft carts feature natural finishes that inspire a peaceful feeling. Their functional and attractive design is sure to bring tranquility into your quiet study space. 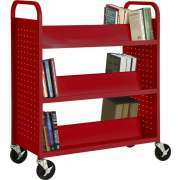 If you are looking for something that is strong and virtually indestructible, metal library carts are an excellent option. We offer all-steel models from Sandusky Lee that feature welded construction. They are available in a selection of vibrant and muted colors. Classic colors will blend into any space while bright classroom colors are easier to find, especially in a storage closet or other tightly-packed space. 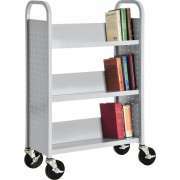 What kind of shelves are good on a book cart? In addition to color and material, there are other factors that vary across library book cart models as well. 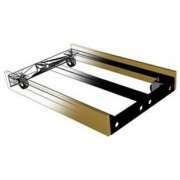 Level shelves are a good choice if you are transporting other items in addition to books. They are a great tool for oversized or unwieldy items such as boxed games and puzzles. Tilted shelves are a better option if you are only transferring regular-sized books. They enable you to read titles without leaning over or lifting books. This is an ideal arrangement for reshelving purposes when you just need to see the title and call number in order to determine the correct space. 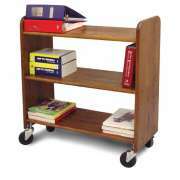 Book carts also work well for delivering textbooks to classrooms or returning them to book storage closets. Where is a good space to display books? Mobile book displays are great for school libraries, classrooms, reception areas and anywhere else where people might be inspired to explore some new literature. Octagonal book displays from Russwood offer many different sides and angles for a variety of literature arrangements. This is an excellent setup for advertising featured books on monthly themes or timely topics. The four-sided book display from wood designs offers spaces for more than just books. It is constructed from natural birch plywood with a healthy, environmentally-conscious finish. 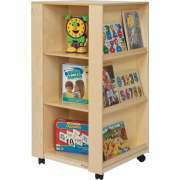 These versatile rolling book carts can accommodate literature as well as other items such as toys, puzzles and educational games. They are great for preschools, daycare centers or elementary school classrooms. Their configuration is excellent for an alternating themed learning center. 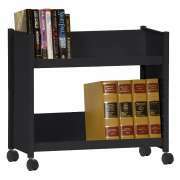 Can I get a heavy-duty book cart? When a classic library cart just doesn&apos;t suit your needs, consider a choice of outstanding alternative arrangements. 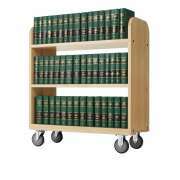 If regular capacity isn&apos;t enough, the Titan cart can transform double-sided Russwood bookshelves into a book cart. This exceptionally-strong piece can mobilize an incredible 400 pounds of books. 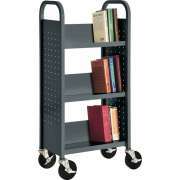 The big book storage cart is another great option, if you need a piece that is specially designed for oversized books. It can be used with or without wheels and provides easy viewing of book titles. Book displays come in different widths, heights and numbers of shelves, so you can find the selection that provides the capacity you need. We even have a double-sided option. This unit holds a high capacity of books in an upright position so all titles are clearly visible. 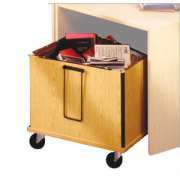 Some library carts feature built-in handles for easy steering. 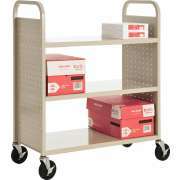 Whether you need a tool for reshelving in the library, delivering books to classrooms, or transporting textbooks, our selection of book carts offers great choices. Choose from a variety of book displays, library book trucks and library carts to find the ideal model for your institution. With so many great choices, it&apos;s hard to know which option will best fulfill your personal needs. The Hertz Design Center is here to help you determine the optimal choice whether you just want one book cart or you are ordering a whole fleet.